The World War One Roadshow at Trinity College Dublin, in partnership with the National Library of Ireland and RTÉ is part of a major retrospective to mark the centenary of World War 1. This day long programme on Saturday, July 12th, will feature a Family History Collections Day where members of the public are invited to register to bring along family items, letters and mementos related to the war for cataloging for an online European archive and for reviewing by a team of experts from the National Library of Ireland. It will include a series of pop-up talks and lectures on the Great War, and Trinity College Dublin's own unique history during this period. Music, poetry and drama events will take place during the day in the College Chapel. There will be a range of other activities including history tours of the campus related to the Great War and the 'Last Cricket Match of Peace'. The closing ceremony will finish with ‘The Last Post’ and ‘Reveille’ by the Irish Army's School of Music. These activities are free and all are welcome to what is intended to be an informative, thought provoking and enjoyable day concerning Ireland's part in World War One. The World War One Roadshow forms part of Trinity College Dublin's engagement with the Decade of Commemorations celebrations. The purpose of the Family Memorabilia part of the Roadshow is to give Irish families an opportunity to bring their precious items and memories related to World War I to be catalogued, digitised, and uploaded to the Europeana online archive (Europe's digital library, museum and archive) in time for the 100th anniversary of the outbreak of the war in 1914. It will be the first ever online European archive of private stories and documents from World War One. See www.europeana1914-1918.eu. Experts from the National Library of Ireland and Trinity College Dublin will review and record the memorabilia presented on the day for the purpose of the archive. (PLEASE NOTE: The Family Memorabilia event is now fully booked and only those who have registered wil be able to participate in the Public Theatre. For enquiries please contact Sarah at 01 8963174 or Caitriona at 01 8964517. Those who would like to contribute to the online Europeana project but are not registered to participate in this part of the WW1 Roadshow are welcome to come along on Saturday to receive advice on how to take part in the project at a later stage. Please do not bring memorabilia on Saturday unless you have successfully registered (registration was through the RTE website and closed a week ago) as your items will not be reviewed. Free advice will be provided by Timeline Genealogy Ireland, Eneclann, and Findmypast.ie. Venue: Graduate Memorial Building, Front Square. More in-depth explorations of the Great War by some of Ireland's leading scholars. Thousands of Trinity students, staff and graduates fought, and almost five hundred died, in military service during the Great War and its aftermath. Those who died are remembered in Trinity's Hall of Honour. A small, thought-provoking exhibition of diaries, photographs and objects from Trinity College Library's WWI research collections, curated by Aisling Lockhart of the Manuscripts & Archives Research Library. Visit this exhibition, the Old Library and the Book of Kells 'Turning Darkness into Light' exhibition and the Library Shop. Also on view is Emperor of the Irish: Brian Boru and the Battle of Clontarf 1014 - part of the millennium commemorations of this historic battle. Take advantage of a special reduced rate of €5.00 per person during an extended opening time between 5pm and 7pm after the Roadshow. A limited number of academic tours of the Trinity campus related to the period of the Great War led by Dr Tomas Irish and Dr Ciaran Wallace. Meeting Point: In front of the College War Memorial, the 1937 Reading Room. 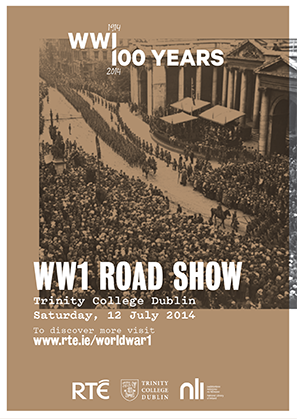 World War 1 letters, diaries and music directed by RTE Radio 1’s Drama Department. New contributions written especially for this event from Maurice Cashell, Sally Neary, Micahel O’Loughlin, John MacKenna and Mary Morrissy. To be broadcast on RTÉ Radio 1 on Sunday 3 August 2014. With story teller Jack Lynch. With Domini Kemp and Catherine Cleary - RTÉ's History on a Plate team. Cookery demonstration with commentary. Trinity 4 XI vs Ashbourne. Dublin University Cricket Club is one of Ireland's oldest and foremost clubs. Currently the only Irish University playing league cricket, the club fields 3 men's teams and a women's XI in the Leinster Leagues. The club has just completed its 177th season which has been hugely rewarding both on and off the field. Enjoy traditional afternoon tea in the 18th Century College Dining Hall at a special rate of €10 pp. Venue: Dining Hall, Front Square. Young people read poetry related to WWI. Presented by Poetry Ireland and the National Library of Ireland. Including 'The Last Post' and 'Reveille' performed by bandsmen Aran Johnson and Mark O'Connor from the Defence Force's School of Music. Most venues involved in the Roadshow are accessible. The exception is the 1937 Reading Room which houses the College War Memorial.